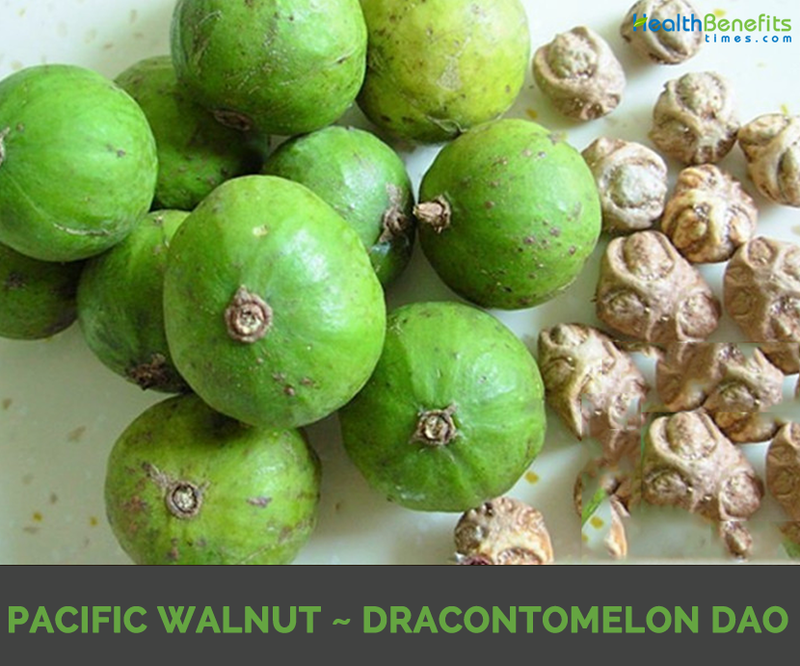 Dracontomelon dao also known as New Guinea walnut, Pacific walnut, or Paldao, is actually a tropical canopy tree well-known mostly by its height for its greyish-brown trunk which is branchless up to about 20 m (66 ft.). 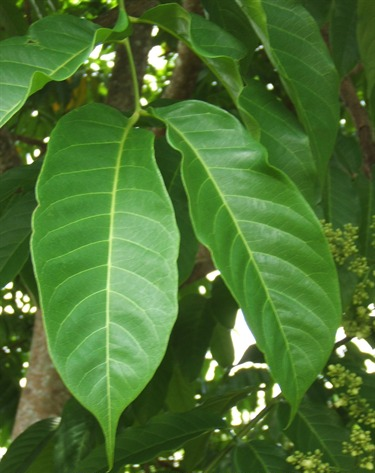 The plant belongs to Anacardiaceae (Sumac family) and is native to eastern India, Andaman Islands, South China, Myanmar, Indochina, Thailand, Peninsular Malaysia, Indonesia, Philippines, New Guinea and the Solomon Islands. The species name is taken from the tree’s name in Filipino. 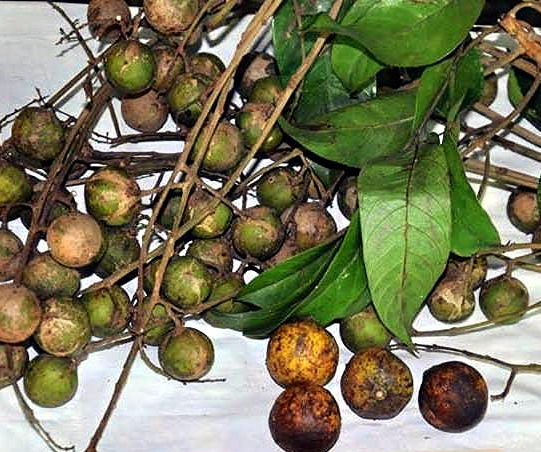 Other popular common names of the fruit are Argus pheasant tree, Mon fruit, New Guinea walnut, Papua New Guinea walnut, pheasant tree, Papuan Walnut, Asam Kuang, Sengkuang, Sekuan and Kueh. Genus epithet ‘Dracontomelon’ is derived from Greek terms for dragon (draco) and melon, a reference to the fruits. 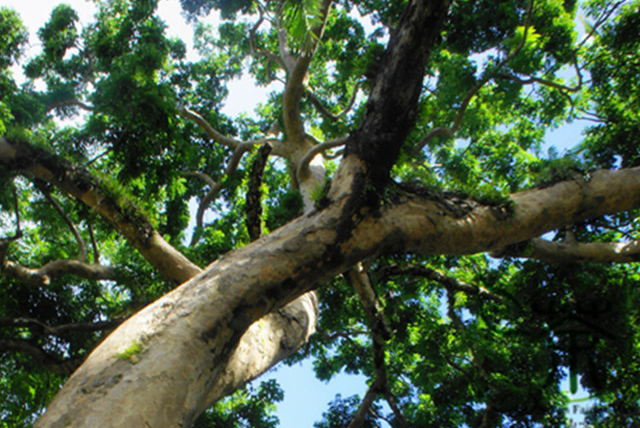 Species epithet ‘dao’ is derived from vernacular name for this tree in Philippines. Pacific Walnut is a large, tall, erect, deciduous tree that grows about 36 m high with a large trunk of 70–100 cm diameter. The plant is found growing in undisturbed primary or secondary, evergreen or semi-deciduous (monsoon) forest in tropical areas and especially along riverbanks and in swampy sites, occasionally flooded for short periods. The plant is found scattered on well-drained to poorly-drained, clayey to stony soils, organosols, gley humus soils or red-yellow podsolic soil, on alluvial flats and in swampy areas and along river banks. 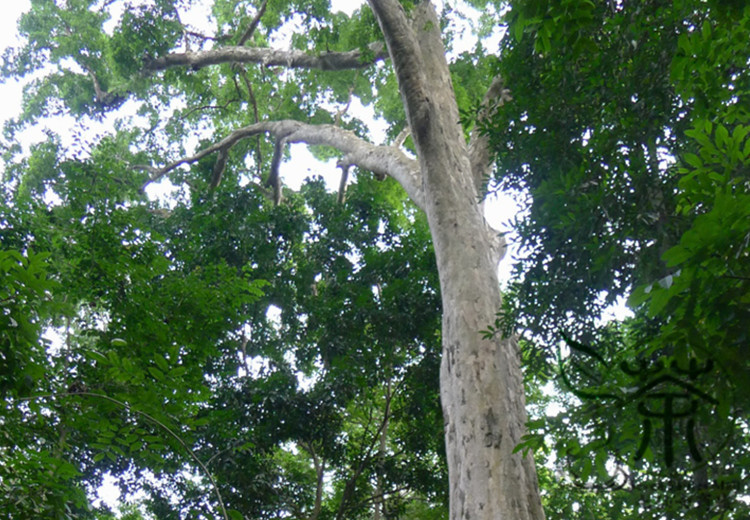 Trunk is straight and cylindrical, unbranched to 15m height, with root buttress at base. Outer bark is greyish-brown and inner bark is pink. Wounded bark exudes slightly sticky colorless resin which turns pale golden upon exposure to air. 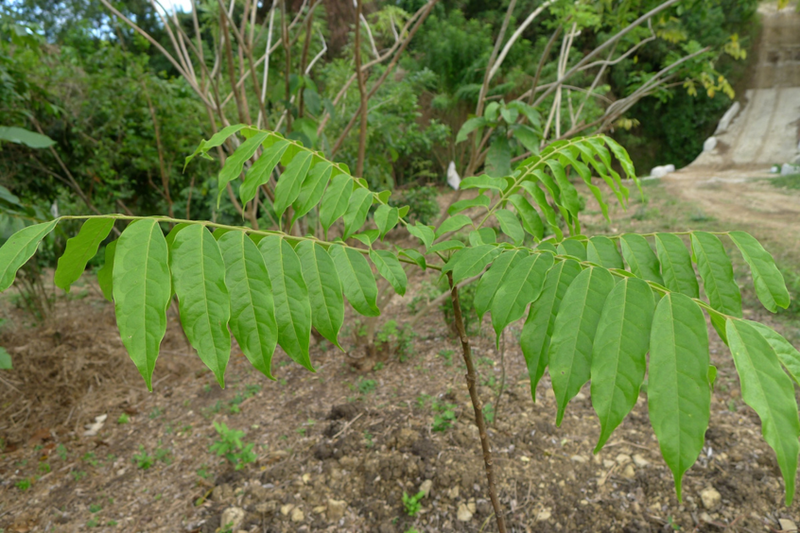 Leaves are arranged spirally, crowded towards the ends of branchlets, large, imparipinnate with 6–44 cm long leaf rachis and 4–9 pairs of leaflets. Leaflets are alternate to opposite, chartaceous, sub coriaceous, elliptic-oblong, oblong, ovate oblong to lanceolate, 4.5–27 cm × 2–10.5 cm, glabrous or sometimes pubescent below, lower surface pale green, upper surface dark green with 3–10 pairs of nerves. Young leaves are brownish yellow in color. Flowers are bisexual, stalked, actinomorphic, 5-merous, slightly fragrant, white to greenish-white, 7–10 mm long, in panicles of up to 50 cm long; petals are oblanceolate and valvate but imbricate at the apical part, puberulous outside or on both surfaces, or glabrous. Stamens are in 2 whorls, filaments are glabrous, and anthers are dorsifixed, disk intrastaminal, puberulous or glabrous. Pistil is composed of 5 carpels which are free but connate at base and apically. Ovary is superior, 5-celled with a single ovule in each cell, styles 5, stigma is capitate. Fruit is drupe, globose, 5-celled, or seemingly 1-celled by abortion, each cell with a distinct operculum, endocarp lentiform, woody and hard and with 5 oval markings on the upper side of the fruit. Fruits are green when young turning yellow when ripe. In china, fruits used to cool and relieves itchiness, cure internal ulceration and as antidote for poisoning in China. Bark can be used for dysentery. Fruits can be used to soothe sore throat and inflammation of the skin. Indonesians drink a decoction of bark to expel the membrane enveloping the fetus in the womb. 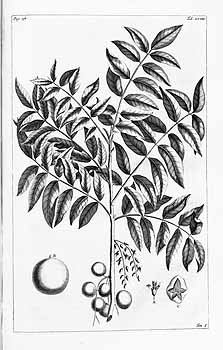 Bark is used in traditional medicine to provoke an abortion. 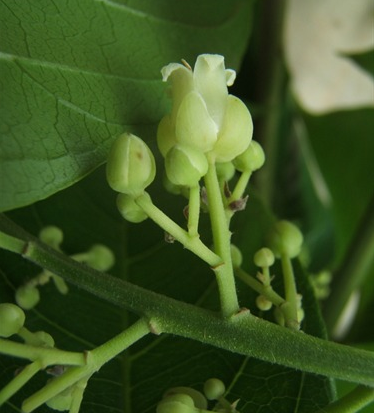 Leaves and flowers are used in traditional medicine. Fruit is depurative and is used in the treatment of dermatitis. Mature fruits are used in dentistry. 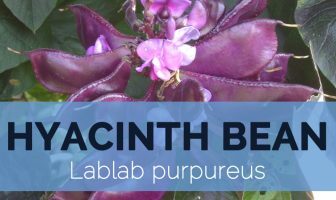 Leaves found to possess antiseptic properties against broad spectrum of bacteria. Fruits reportedly have cooling properties and are used to treat sore throat, skin inflammation, itch, internal ulcers, as well as an antidote for poisoning. 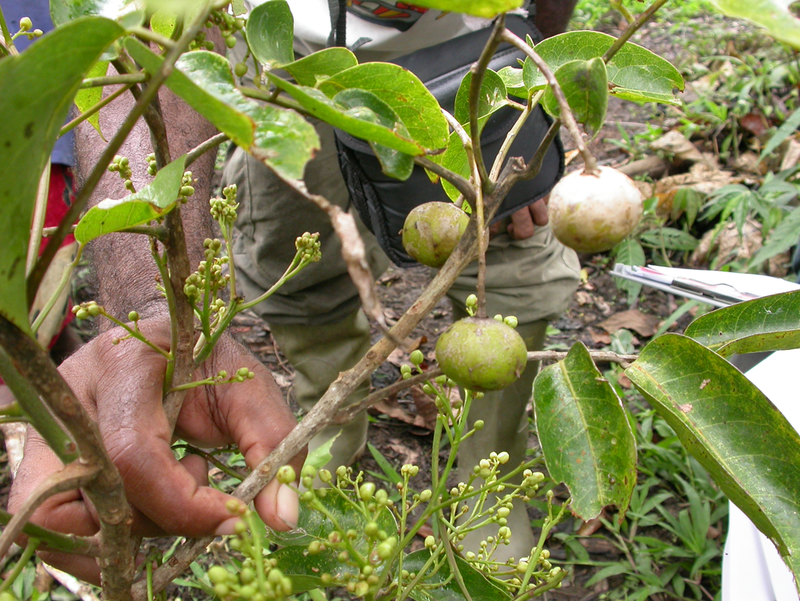 Young fruits are used to flavor curry, and the edible flesh covering the seed is sweet-sourish and eaten in Thailand. Fruit is used as a sour relish with fish in Malaysia. Seed kernel is also edible. Flowers, fruits and young leaves are eaten cooked as vegetable e.g. in Vietnam, Thailand, East Malaysia and Papua New Guinea. Flowers and leaves are used as spice for flavoring food in Maliku, Indonesia. Small, sourish-sweet fruit is cooked with soy sauce and eaten with rice, or used for flavoring curries. Flowers and leaves are cooked and eaten as a vegetable or used as a food flavoring. Fruits are edible, fresh or stewed in honey. Kernels mixed with tea impart a fragrant and mucilaginous sweet taste. Tree is use for firewood and provides a source of commercial dao timber which is soft and light and not very durable. Usually colorful timber is extensively used for furniture and interior finish, and also for joinery, cabinet work, shop fittings, decorative (sliced) veneers, plywood, paneling, molding, flooring, light construction, fence posts, house posts, rafters, boat-building, shop fittings, cladding, lining, boxes, matches, turnery, carving and artifacts. Wood is also appreciated for joinery and turnery. Tree is planted as an ornamental in roadside plantings. Seeds are used by kids as toys. Trees are used as firewood. It is believed that holding a seed in right hand on odd days and the left hand on even days will precipitate childbirth. Thai: Prachao Ha Pra-Ong, Dao, Ka-Kho, Sang- Kuan, Dao, โกซังกวน Goh sang guan, กะโค Ka-kho (Gakoh), พระ เจ้าห้าพระองค์ Phra chao ha phra ong, สะ กวน Sa guan, แสนตาล้อม Saen taa lom, ตะโก Ta goh, ตะกู Tagoo, ซังกวน Sang kuan. Sap of the tree may be irritating and /or poisonous. Dracontomelon mangiferum var. puberulum (Miq.) Engl. Dracontomelon mangiferum var. pubescens Koord. & Val.